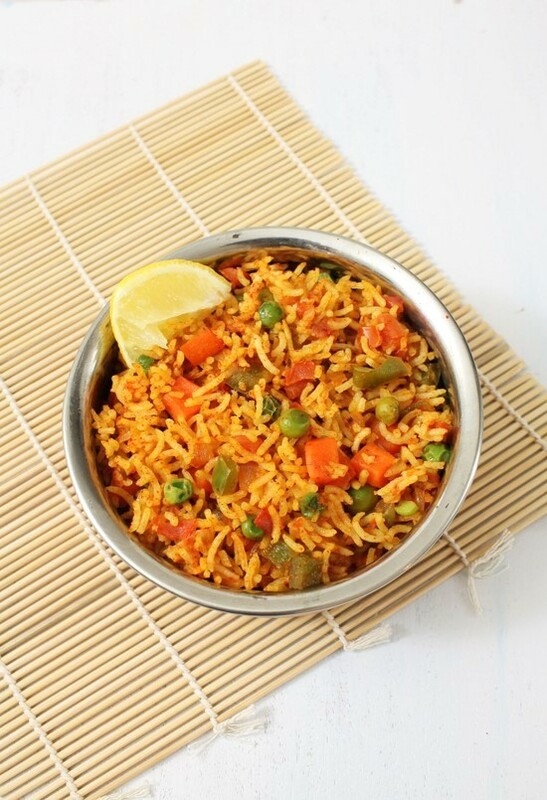 Tawa pulao recipe or Tawa Pulav- Cooked rice is sauteed with vegetables and spiced with pav bhaji masala. Tawa pulao is popular Mumbai street food. All the pav bhaji stalls serves this delicious rice called tawa pulao. They make this in big batches earlier and give you appropriate portion with a dollop of butter on top as you order. It has flavor of pav bhaji in it. It is not only available in Mumbai streets, but now all over the India there are many pav bhaji stalls and they serve this yummy pulao. Basically it is prepared on same tawa/tava on which pav bhaji is made. So it is known as tawa pulao. It can be made from left over rice at home. But dear husband likes this pulav so much; I do specially cook rice to make this pulao. 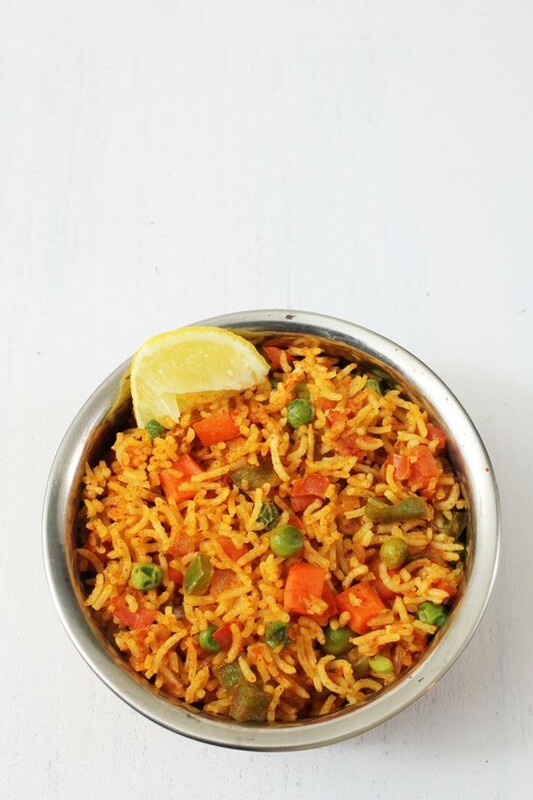 Lots of veggies are added to this pulao, and pav bhaji masala and lemon juice take this pulao to the whole new level. It is so flavorful. To serve it same as stall or restaurant style. Remove the pulao on serving bowl, add dollop of butter on top and lemon wedges on side. 1) Take green peas and carrot in a microwave safe bowl, sprinkle little salt and add few tablespoons of water. Cover it and microwave it for 3-4 minutes (time varies depending on your microwave). I have used frozen peas but if you using fresh peas then you need to cook few more minutes. Alternately you can boil them or pressure cook them or steam them. 2) Heat the oil and butter in a pan. on medium heat. 3) Once hot add cumin seeds and let them sizzle a bit. 4) Then saute ginger paste, garlic paste and green chilies for a minute. 5) Mix in onions, sprinkle some salt to speed up the cooking process. 6) Cook till they are light brown in color. 7) Add green pepper and tomatoes. 8) Mix well and add ¼ cup of water, so tomatoes get cook fast. 9) Add turmeric powder, red chili powder and pav bhaji masala. 11) Let it cook till tomatoes are almost mushy and oil starts leave the sides of the pan. 12) Add cooked peas and carrots. 13) Mix and cook for 2 minutes. 15) Mix everything very gently without breaking the rice grains. cook for 2 minutes, so rice gets heated through. 16) Finally squeeze some lemon juice, mix and it is ready to serve. 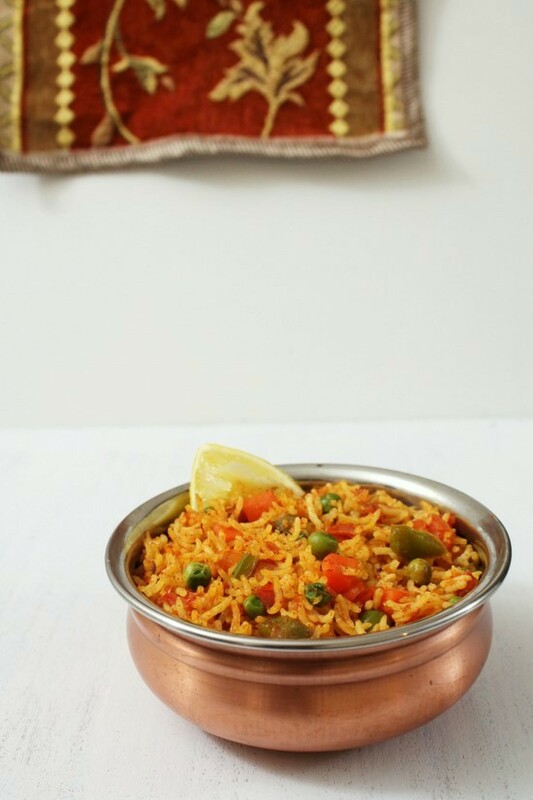 Make this delicious and exactly same tasting as street stalls tawa pulao at home. Enjoy.. Serving suggestions: Serve this tawa pulav with onion raita or onion-tomato raita or plain yogurt. Have some roasted papad on side to have some crunch. Take green peas and carrot in a microwave safe bowl, sprinkle little salt and add few tablespoons of water. Cover it and microwave it for 3-4 minutes. I have used frozen peas but if you using fresh peas then you need to cook few more minutes. Alternately you can boil them or pressure cook them or steam them. Heat the oil and butter in a pan on medium heat. Then saute ginger paste, garlic paste and green chilies for a minute. Mix in onions, sprinkle some salt to speed up the cooking process. Cook till they are light brown in color. Add green pepper and tomatoes. Mix well and add ¼ cup of water, so tomatoes get cooked fast. Add turmeric powder, red chili powder and pav bhaji masala. Mix well. Let it cook till tomatoes are almost mushy and oil starts leave the sides of the pan. Add cooked peas and carrots. Mix and cook for 2 minutes. Mix everything very gently without breaking the rice grains. cook for 2 minutes, so rice gets heated through. Finally squeeze some lemon juice, mix. Top it with butter before serving. It is optional. Hi planning to try this… It looks yummy… Can you please tell me whether I can use basmati rice for this. Am newly married and in US…far away from my family..had never cooked…have been following and cooking with ur recipes since a while now…and trust me they all turn a hit….v had friends coming for dinner and I made ur tawa pulao and palak paneer with other dishes….and they LOVED it…. 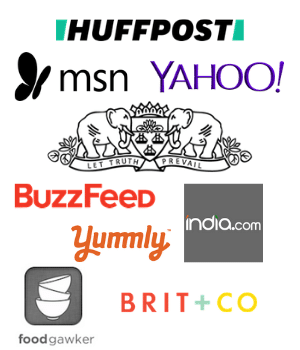 Also…can u please add dahi kadhi recipe…..
thank you for your positive review. Nice to hear that you and your guests enjoyed. I am vegetarian and so this website has only veg recipes. There are many kadhi recipes on the blog. Please use the search box located on top of the page.